Popular booking site Ebookers can be also used to book accommodation including hotels, hostels, bed and breakfasts and other forms of accommodation. 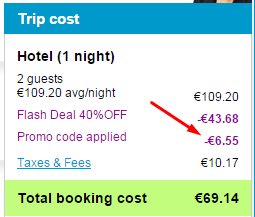 You can now get nice 14% discount on Ebookers if you book hotel stay and use discount code displayed below. This Ebookers discount code 2016 works for stays until end of August 2019. There is no minimum purchase for this Ebookers promotional code. This Ebookers promo code works only on selected hotels excluding big hotel chains and special promotion deals. To get the discount at Ebookers, select your hotel and continue the booking process until the payment page where you can locate the “Promotion code” field. Enter the discount code in the “I have a promotion code” field and confirm it to see the lowered price. The Ebookers.com promo codes displayed above work until 14th February 2016, some of them work until end of April 2016. These promo codes should work also on Ebookers.de, Ebookers.at, Ebookers.ie and other language mutations.